If God is leading you, there is nothing that you lack. Why is the Lord referred to as a Shepard? Back when this scripture was written it was so that the people could get a great mental picture. 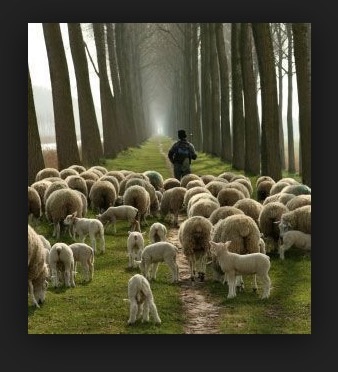 There were lots of sheep herders during that time and the people can easily relate. Today we could say “The Lord is my Boss, he makes sure I have everything I need. -the DeShannon Dixon translation. Let’s look at what a Shepard does. The same can be said of your earthly Boss; whether the Boss at your home or the Boss of a company. They have the similar characteristics. If God is your boss, he will make sure you have everything that you need. Now ask yourself this question. Do you have what you need? Two questions come to mind if you don’t have what you need. 1. Is God your boss? 2. Have you asked for what you need? Have you truly let God lead you and guide you, protect you, look after you. Have you gone to him in prayer asking and believing for the things you need in life? Listen, even if God says no, ask anyway. You never know unless you open up your mouth and ask. The bible also says ” I will withhold no good thing from you” Psalms 84:11 so hey what do you have to lose. With God as your boss, he will make sure you have everything you need to complete any task you have been assigned. He even throws in unexpected bonuses. You’ve tried finding your own way, and I can already tell you that didn’t work out for you. So try letting God led you. Father, How wonderful you are that you led me and guide me, please forgive me for times when I didn’t follow you. Your word declares ask, and it shall be given. I ask for _____________ and believe that you will not withhold any good thing from me. In Jesus Name. Amen. I know as children we are taught to say your prayers before you go to bed at night. This is a habit most adults have continued. Just imagine what kind of day you would have if you prayed BEFORE you got up in the morning. You may just have less problems to pray about at night. Try this: your morning prayers ask for direction throughout the day; your evening prayers thank God for how he led you and provided for you. Doing this simple change has transformed my life. God wants to bless you, he wants you to prosper both physically and spiritually all you have to do is let him lead you. *this is taken from a devotional I have written that I may publish sometime later this year.